For the second time this year, we are under a moderate risk for severe weather. A warm front moved through the area earlier this morning, which will push temperatures into the upper 90s later today. A frontal boundary is set up to our west and will push eastward into tonight. Large clusters of supercells will accompany bowing lines of storms later this evening along the front. 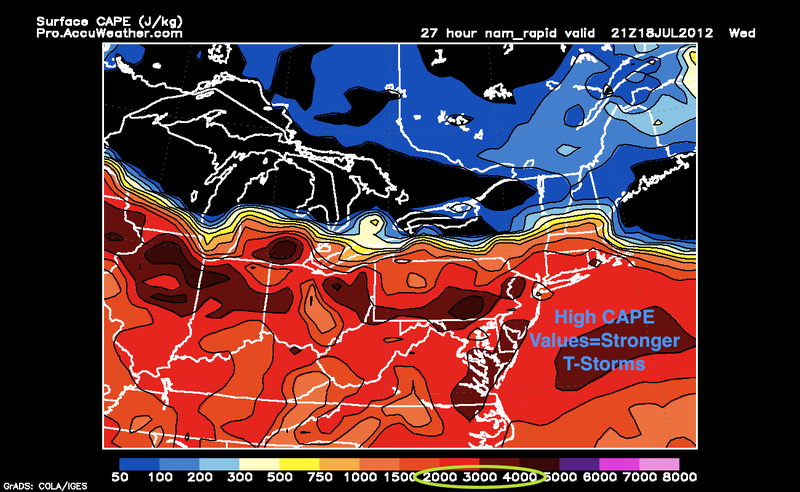 CAPE values will also increase throughout the day, causing the atmosphere to become increasingly unstable. The heat, combined with an unstable atmosphere, is a classic recipe for a severe weather outbreak. The biggest threat with these storms will be wind damage. But an isolated tornado or hail report would not surprise me. As daytime heating occurs, storms should start to pop up in Western PA; when these storms do start to flare, I’d expect a Severe Thunderstorm Watch to be issued. Remember, if you can hear thunder, then go inside as soon as you can. These storms today will pack quite a punch where they hit. Hi everyone. This is a special alert post, as we have a threat for a damaging squall line to form. A warm front will pass through the area this morning and combine with a southerly flow, creating instability in the atmosphere this afternoon. Storms should form in northern PA by mid afternoon and start moving southeast. 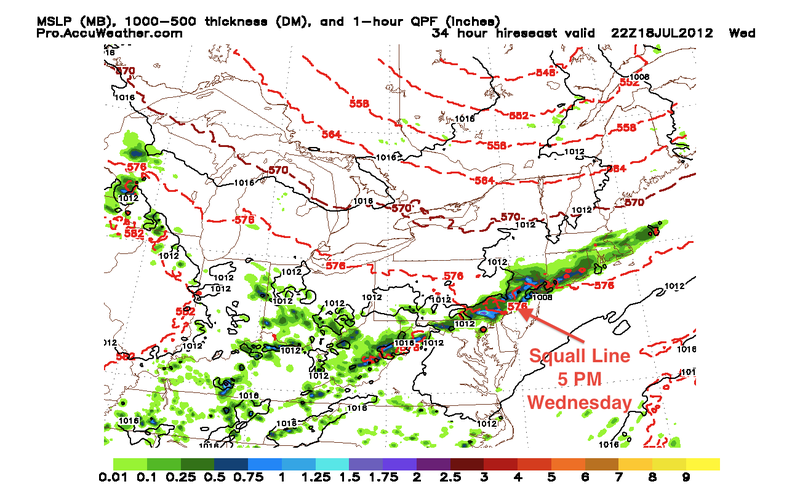 I do expect a severe thunderstorm watch to be issued by this afternoon, as the squall line gets its act together. The storms will mainly have very damaging winds and dangerous cloud to ground lightning. Skies should start to clear after 9 PM tonight, after the line moves through. The Phillies are also playing tonight, and the game will likely be affected by these storms. We have another chance of t-storms tomorrow, as a cold front will move through the region. Hi everyone. After Sunday’s storms, it has gotten extremely hot throughout the Philadelphia region. Today’s highs reached into the upper 90s with heat indices in the 100s. All of this oppressive heat will end after a cold front passes through the region tomorrow. All of the heat ahead of the front, instability of the atmosphere, and high CAPE values will fuel some very nasty thunderstorms tomorrow afternoon. The first cells should start popping up to the northwest of us around noon and begin to barrel southeastward toward the area. I expect a Severe Thunderstorm Watch to be issued in the morning tomorrow. The storms will have damaging winds, large hail (strongest storms will have hail that approaches 2″), and frequent lightning. If you see dark clouds tomorrow, go inside as soon as you can. After the storms pass by tomorrow, temperatures will moderate. Highs could only reach the upper 70s on Friday, before a slight warm up for the weekend.